Barrett All: Please Enter Your Password, then press #. Please Enter Your Password, then press #. I've been toying with the idea of moving to NYC in the fall. And today, while scouring through my NYC DailyCandy newsletter (I receive both Boston and NYC) I was like, "Man, it'd be so cool to go there! I'd totally go there... etc etc etc." and then I realized, there are like 100 places in Boston that I think "would be cool" but I never, ever go. What makes me think moving to New York would all of a sudden make me ten times more adventurous? I'm more of a "find one and stick with it!" 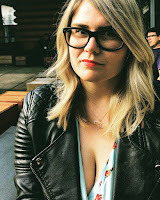 kind of gal. Which would explain why I've barely crawled out of the basement of the Asylum for years. And Silvertone is my go-to restaurant for everything in Boston. Or, even better, going to Vegas and going to the SAME THREE PLACES every single night. I'm also like that with vacations. I go to the same places all the time because I know them and I stick with them. I've been to Disney World 5 times, or 6, I lost count. New Hampshire, Chicago, New York City, and now Vegas. It's time to step out of the box and go to somewhere like... Iowa. No... No. I take that back. It's a rare occasion when I try something new, but the fact of the matter is - I always have a good time when I do. New adventures are my FAVORITE. Hey, there was a point in time when Silvertone was new! And IA was a hot, new and exciting place to go... all of 7 years ago. I want to go to the ICA to see Shepard Fairey, the street art exhibit. I love street art. 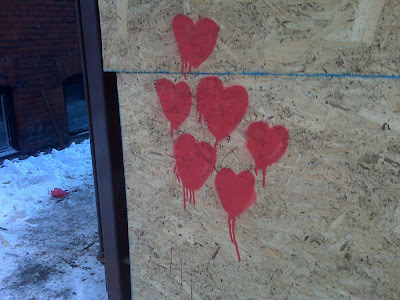 I even love little hearts spray painted on some plywood on Cooper St. in the North End. Also - there are these posters being put up everywhere with this guy's face... and I'm pretty sure it's Corey from Seriously Bent. Just sayin'.